René Jacobs is a man of conviction. One of his convictions is that audiences have been having it too easy with the Magic Flute since Mozart's death. They have had tempos that are too slow, large sections of the spoken libretto omitted, and characters stereotyped to the verge of pantomime. He's putting things to rights with this present recording, which means returning the sense of ordeal to the work, not only for its characters, but also for its audience. It's not going to be to everybody's taste, but the integrity of the approach is undeniable. The integrity of the libretto is one Jacobs' most radical departures. By including all the spoken dialogue, his interpretation runs to 3 CDs rather than the more conventional 2. He resists the idea that the music is superior to the libretto and that it needs saving from the silliness of the story, in fact he positively revels in the silliness, entrusting a gamut of comedy effects to the orchestra's percussionist. The sheer quantity of spoken dialogue is a problem, especially in an audio recording, but Jacobs does his best to enliven it. Characters speak over each other, and over the intros to musical numbers. The fortepiano has a prominent ad lib presence, giving us bursts of all sorts of Mozart works from the pit. Most intriguingly of all, a social hierarchy is suggested through the accents of the spoken German, the aristocrats, and Tamino in particular singing in high German, while the more lowly characters, most notably the three ladies, affect a thick Viennese accent. Unless your German is good enough to follow the words, you do need some patience to get through the mainly spoken first half of each act. It is worth it though, because the sheer theatricality that the approach imbues to the work transforms it into something far more integral than the extracted music would suggest. When you actually get to the music, much of the performance is of exceptional quality. The mainly German cast contains few names that are well known in the UK, but all are equal to the task. The female voices are the most impressive, Marlis Petersen as Pamina and Sunhae Im as Papagena. The nobility of Daniel Behle as Tamino is also a valuable asset to the production. Two of the singers, Anna-Kristiina Kaappola as the Queen of the Night and Marcos Fink as Sarastro, have a tough time of it because of Jacobs revisionist ways. He insists on the Queen of the Night's top Fs taking the vowel 'e' rather than 'ah', which apparently is closer to the original conception, but doesn't make things easy. Marcos Fink is very young (at least by modern standards) for the part of Sarastro. This is part of Jacobs' effort to reduce the caricaturing of the role, but it is a tall order to maintain the characterisation with such a light voice. 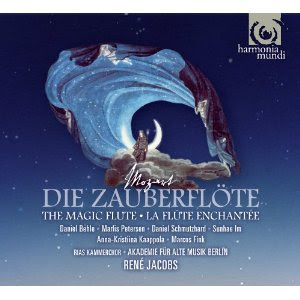 Most recordings of the Magic Flute, even on period instruments tend to have a very clear, pure orchestral sound. Again Jacobs resists this and goes for more gritty instrumental textures. This is particularly noticeable in the overture, where the normally monolithic string and woodwind chords are given a much more burnished hue. But that, I suppose, is all part of the plan. Whatever you experience while listening to this, Jacobs and his team are out to make sure you take nothing for granted. The conviction that this is a complex and difficult work, both psychologically and dramatically, is continually hammered home with every interpretive decision. Jacobs' liner essay (and the packaging of this release is up to Harmonia Mundi's usual high standards, libretto and all) makes the point that Mozart and Schikaneder where aiming at two audiences. The work was to be an entertainment for the Vienna masses, but also an artistic manifestation of initiation by trial to satisfy the Grand Masters of the lodge. In his revisionist fervour, Jacobs has perhaps tipped that balance a little too far toward the latter, but the experience of listening remains a pleasure and never an ordeal.